The one you're missing seems to be the first Kuu H cg, where she's masturbating. This is ~early in the game, alternate options at this timeframe (if your prior choices led you there) are the Kotarou takes a bath and complains about heat being troublesome (no CG), Risa helps relieve Silvie (CG). Provided my memory serves correctly, that is. Start a new game (skip prologue), and just pick every Kana/Kuu option, and you should find your way to it reasonably soon. I'm gonna be using your topic, hoennsquall. how do I get the third CG in that list? there's a walkthrough topic in this chat, it gives ALL cg's, so just follow what that says and you should hit it soon. The walkthrough is good, but... as long as we have this topic I may as well ask. 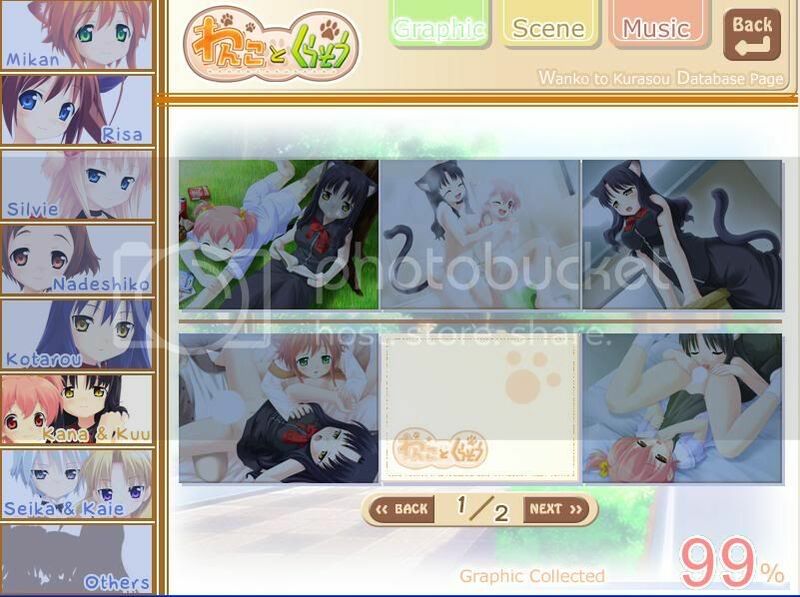 Can someone tell me how to get the Mikan Hscene and CG I'm missing? It's the scene that gives you the first CG on Mikan page 3/4.